Mutual Housing at Spring Lake offers permanent year-round housing to agricultural workers in the state of California, USA. 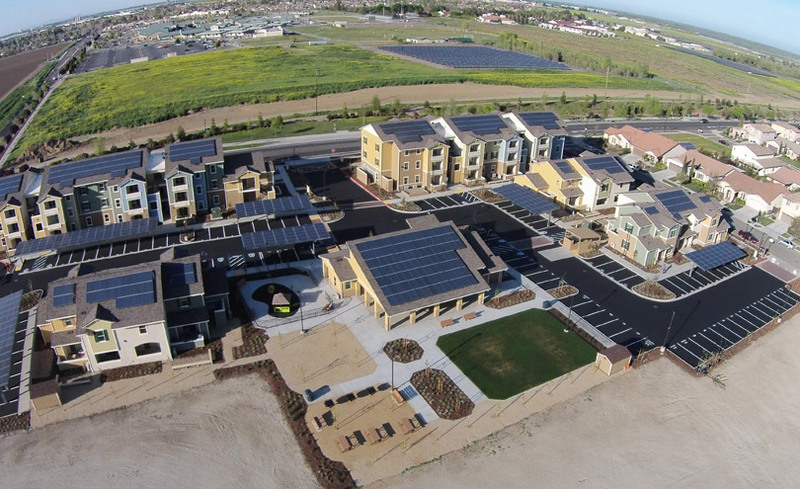 Based in the city of Woodland, Yolo County, it is also the first 100 per cent Zero Net Energy ready rental housing development in the country. Spring Lake was designed to support agricultural workers to enjoy the benefits of ‘green living’, often only available to high-income homeowners. As the homes use around the same amount of energy as they produce, utility bills for residents are extremely low. The estimated 6,000+ agricultural workers in the county have traditionally had to put up with some of the worst housing conditions and most dangerous jobs in the country. Seasonal employment means accommodation is usually only available at government-funded migrant centres during the farming season. Living in appalling conditions in privately rented housing is often the only other alternative for workers. Mutual Housing’s work with residents goes well beyond providing energy efficient homes. Through a range of opportunities including leadership development schemes, peer lending circles and digital literacy classes, residents gain skills and confidence. For many this has opened up new opportunities in education and community life. New leaders have emerged from the community who now work to advocate for the rights of agricultural workers. 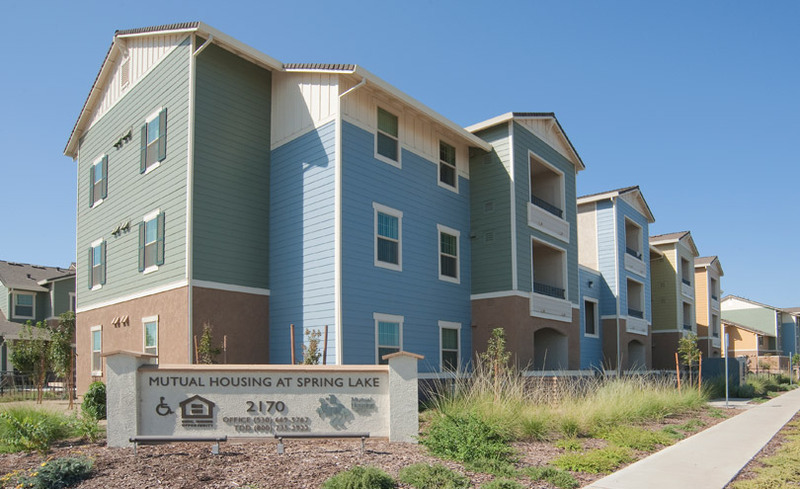 Mutual Housing at Spring Lake is based in the city of Woodland in Yolo County, California. It is the first permanent, year-round housing built for agricultural worker families in the county, most of whom are of Hispanic heritage. Agricultural workers have traditionally suffered some of the worst housing conditions and most dangerous jobs in the country. A survey of agricultural workers in the region in 2010 showed that people reported living in garages with mould and cockroaches and often in overcrowded conditions. Many workers are employed only seasonally and some government-funded migrant centres provide accommodation at these times. However, most agricultural workers stay in the community all year. This is the first 100 per cent Zero Net Energy rental housing development in the USA to be certified by the US Department of Energy. A Zero Net Energy building uses around the same amount of energy as it produces so is very sustainable and better for the environment than traditional housing. Environmentally sustainable homes are often only available to higher income homeowners. This project was developed specifically to cater for agricultural workers, a community which makes a huge contribution to an area where the economy is largely sustained by agriculture, but is not catered for by the local housing market. This development by Mutual Housing California promotes equality by enabling low-income families to rent a home with strong eco-features. Mutual Housing California is a non-profit housing developer and a member of the California Coalition for Rural Housing. It was established in 1988 as a partnership of neighbourhood residents, business representatives, housing advocates and local government to improve housing opportunities for lower income families. It now owns and operates 1,071 homes for over 3,200 residents in California, USA. Resident involvement and leadership are key aspects underpinning and driving all their work. Residents of Mutual Housing developments are supported from day one to identify and develop their own skills and capacity for leadership. They are supported with training and mentoring to take control of their own lives as well as to advocate for their fellow residents and the wider community. 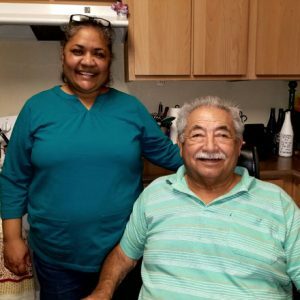 Mutual Housing California provides similar services in its other developments, which include providing affordable rented housing for Housing First and other low-income residents. The work to help residents achieve ‘green living’ doesn’t just stop with environmental features. Residents at Spring Lake are also trained in how to use the energy efficient equipment installed in their homes and are involved in learning and sharing ideas on other ‘green behaviours’ such as recycling and water saving. After overcoming obstacles to access a plot of land and establish its use for multi-family housing (see details in the Context section), in 2010 land was purchased and construction began in 2013. The housing was completed in March 2015 and was fully occupied by June of that year. All applicants for housing at Mutual Housing at Spring Lake had to demonstrate that they meet the established income limits for the housing and that they were or had been employed in agriculture. A total of 62 highly energy-efficient homes have been built in five buildings. The homes have between one and four bedrooms and house 196 people including 90 children. Out of these housing units, seven are for families that have incomes at 30 per cent of area median income (AMI) or below, 13 units are for families that have incomes at 40 per cent of AMI or below, 25 units are for families at 50 per cent of AMI or below, and 16 units are for families at 60 per cent AMI or below. One of the units is reserved for the manager. Mutual Housing at Spring Lake has a very strong focus on community development and the empowerment of individuals. Community organising is a core activity – the project has really been about building a whole community, not just constructing houses. Residents are actively involved in education and training programmes and the development runs several different facilities and programmes for residents. Personal development opportunities delivered through one-to-one mentoring, group sessions and on-the-job training have included financial education and budget management, green issues, leadership development and health education. As well as learning opportunities residents are able to use the community building and an activity room for meetings and celebrations. They can enjoy outdoor recreation spaces, with shared gardens and green spaces throughout the site. A Spanish-speaking community organiser has been appointed and they have an important role in developing the leadership potential of adults and young people. They help local people to form resident councils and committees to address any specific issues or to shape ideas and plans for community activities and events. In fact leadership development is a very strong focus within the wider work of Mutual Housing. One of their key aims is to create ‘lifelong leaders’ by supporting the personal development of adults and young people alike across a wide range of activities. Some of the residents have shown that they are particularly interested in sustainable living and they have formed a ‘Green Leaders’ team. This group helps educate fellow residents with activities like composting and understanding electricity bills with solar rebates. Offering affordable rents and low utility costs. Advocating for the rights of migrant workers to decent housing in the community in which they have settled. Enabling this marginalised group to access the benefits of green and healthy living. Encouraging wider integration by locating this housing in a relatively affluent area. Encouraging a strong local community and resilient individuals of all ages through resident participation and leadership development. Demonstrating the benefits of Zero Net Energy rental housing to encourage other housing providers to follow. Rental costs in this part of California increased by 3.5 per cent year on year from 2011 to 2016. At the same time, the number of properties available to rent decreased dramatically. The local housing authority has more than 10,000 applicants on its waiting list for public housing and nearly 4,500 applicants waiting for federal rental subsidies. This shortage means that low-wage agricultural workers struggle to find rental housing that they are able to afford. There are an estimated 6,340 agricultural workers in Yolo County. Men and women work in manual agriculture between 10 and 12 hours a day, six days per week. Most of the workers are employed by contractors (middle men) rather than by the farms themselves. Many agricultural workers are exposed to harmful chemicals through working with insecticides and fertilisers etc. Prolonged manual labour also commonly causes arthritis and joint problems. Families often take their children to work in the fields during the school holidays in order to earn more money and because there is no affordable childcare available. In 2010, Mutual Housing California surveyed agricultural workers at their workplace about their housing concerns. The results showed the biggest problems people experienced were high rents and high utility bills. Much of the housing available was seasonal but many of the workers lived in the area, often in unsuitable housing, throughout the year. This highlighted the need for permanent year-round affordable housing for workers in the agricultural sector. Woodland is a small city with a moderate commitment to socio-economic integration, in part driven by state housing policy. City policies require new planning areas to designate a minimal amount of land for multifamily, higher density housing. Housing developers building single-family homes are required to pay fees which the city uses to support affordable housing. In 2010, when this project site was one of just a few multifamily plots of land remaining in a new master-planned subdivision, Mutual Housing learned its owner had filed to rezone the site for single-family housing for higher income families, claiming there were no willing buyers of multifamily property. With the support of a community development lending institution that promised to provide acquisition financing, Mutual Housing were able to convince elected officials to resist the rezoning request in favour of the Mutual Housing development. The survey of agricultural workers in 2010 showed that high rents and high utility bills were their biggest housing concerns. 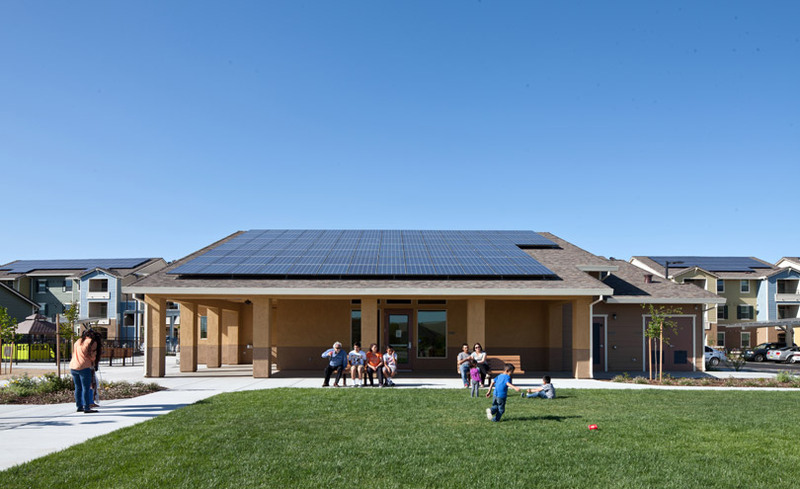 Mutual Housing aimed to address these needs by developing Zero Net Energy homes. In partnership with the local Catholic Church, they held meetings for agricultural workers to discuss which features they would like in their homes. This shaped the efforts of the design team. Before construction began, community outreach took place along with a comprehensive engagement plan to give residents information on the energy saving features of the new development. The design and construction of the housing included a number of features to help save energy and water, generate energy and improve indoor air quality. On moving in, families are given a Residents Green Guide, published in both English and Spanish. This provides information on the community’s green features and uses illustrations of how to use the energy monitors, thermostats and shower valves. It also includes tips on green cleaning methods, recycling and pest control. Residents are offered training individually and in groups on how to operate the air-conditioning and heating systems and how to read and understand utility bills. The Green Leaders team also have an important role in helping their fellow residents to live sustainably. Setting up and supporting resident lending circles with associated financial management training which enables people to develop a more positive credit history, meaning they can gain access to credit (with associated support for the management of debt). Providing digital literacy sessions for young people and older residents. Once the programme of training is completed, participants are given a tablet for their own use (as part of a wider state/national programme). Bike sessions enabling young people to learn how to repair bikes and also a bike lending scheme to encourage residents to use bikes for local transport rather than cars. The + A Culture of College programme run by Mutual Housing across all their sites encourages young people (who perhaps wouldn’t otherwise have considered that university was an option for them) to hear from role models, learn about opportunities and undertake work placements. This helps to raise their personal aspirations for their education and career. There are several examples of families where the young people have started or are planning to start university or further learning. Mutual Housing at Spring Lake has been supported by a number of community and public organisations. 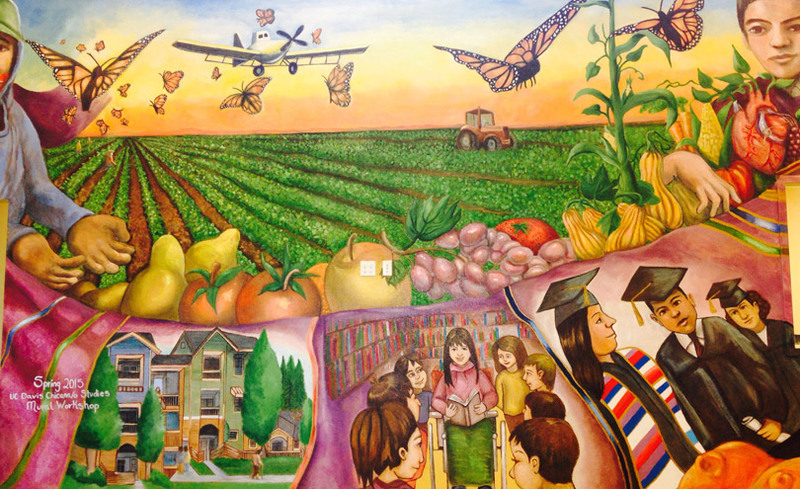 There has also been involvement from other organisations including a Latino Studies class at the University of California, who created a mural based on the life stories of residents, which now features in the community room. a sense of community and inclusivity through living in a resident-centered community of agricultural workers. improved social well-being and integration for agricultural workers. As they can live in the same place all year round they are more visible to the wider community, and able to join in more with local activities. 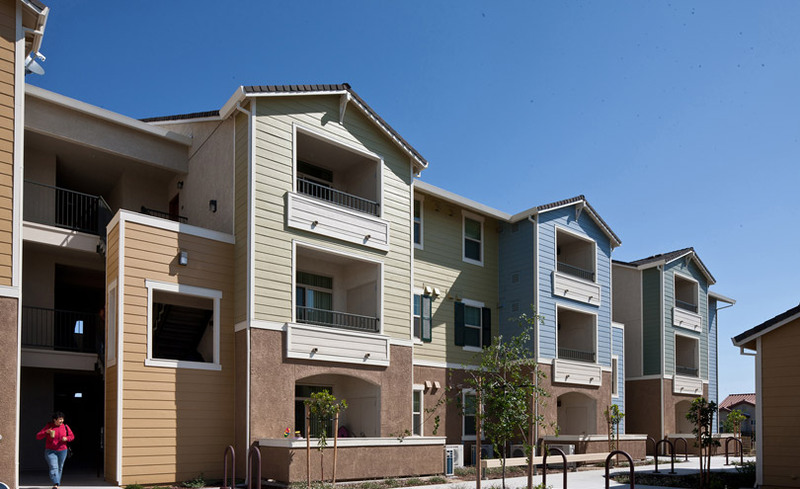 The State of California has announced that by 2020 all newly constructed low rise multifamily buildings must be designed to Zero Net Energy and yet the building industry has not fully geared up for this challenge. Mutual Housing at Spring Lake provides a model to help the industry make this a reality. US$200,000 – Mutual Housing California deferred fee loan. The cost of the energy efficiency measures above the minimum requirements was US$511,000, of which US$400,000 was covered by rebates from the local utility company. The annual operating expenses of the development are approximately US$360,000. This includes costs of administration, property management, repairs, taxes and insurance. Mortgage payments and deposits into reserves to cover future capital needs add an additional US$312,000 in annual expenses. Rental income accounts for around US$410,000, and is used to cover the costs mentioned above (including the mortgage payments, which are repaid by Mutual Housing California directly). The additional income required is covered by federal rental subsidies. Local market rents range from US$1,161 for a one bedroom to US$1,542 for a three bedroom apartment, with very few four bedroom apartments available. In comparison, the average monthly rent for families at Mutual Housing at Spring Lake is US$560. The lowest is US$112 and nineteen households pay less than US$400. 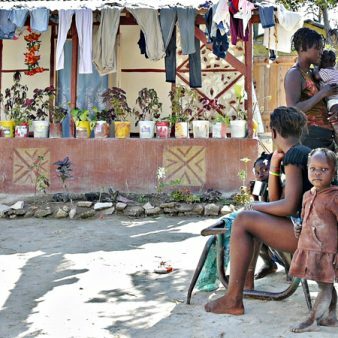 Some households with multiple earners pay up to US$1,000 for a four bedroom home. Even though the US has made significant steps in engaging homeowners with environmentally sustainable living, this project provides a national model for closing the so-called ‘Green Divide’ between homeowners and renters. It is often tempting to focus on the technical features of Zero Net Energy development but the hardest thing to predict is resident behaviour. Residents are empowered to actively reduce their own carbon footprint. It is often assumed that renters are transitory and don’t take pride in their homes. The success of this housing development proves this is untrue. Even if energy saving features are included, if they aren’t understood or used correctly then savings won’t be made. At Mutual Housing all the homes in this all-electric community have a user-friendly monitor with coloured indicator lights that show real time and day-average electricity use. 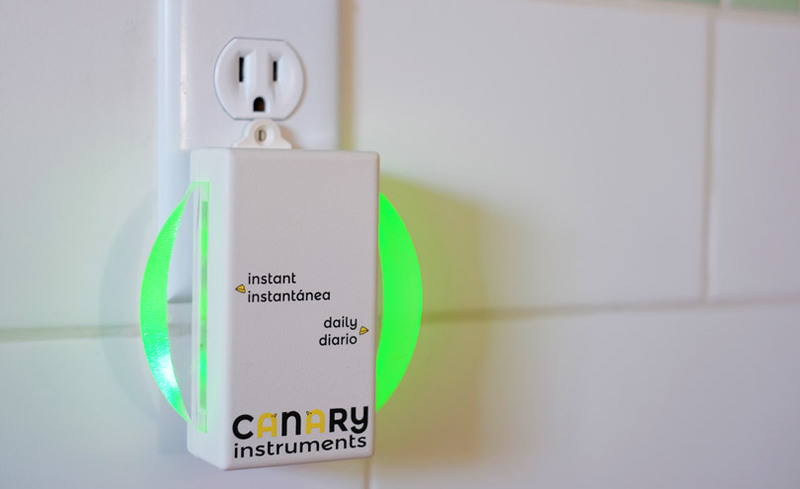 This helps even children adjust their energy use accordingly. The buildings themselves exceed California’s energy conservation requirements by 36 – 40 per cent. In terms of technical features, to achieve a cost-effective, energy-efficient and durable solution appropriate for the local climate, the design team specified an innovative heat exchanger and pump system that supplies domestic hot water and heating and cooling without using natural gas by extracting heat from the outside air and transferring it inside, working in reverse to provide cooling. Also innovative is the amount of attention given to the indoor air quality for residents, whose work in agriculture puts them in direct contact with toxic chemicals: avoiding products that contain formaldehyde and volatile organic compounds; installing advanced mechanical ventilation, high efficiency in-take filters, and return air pathway vents in bedroom doors; and providing outdoor-venting kitchen fans and bathroom fans with continuously operating humidity sensors. Socially, making use of the city’s mixed income housing policy has made it possible for low income agricultural workers who typically live on the margins of communities to follow the US culture of living near community amenities such as schools, shops and parks. With Mutual Housing’s community organiser working with residents they are becoming active members of their community, no longer invisible and now celebrated by elected officials and other local leaders. The work of Mutual Housing California to build the strength and capacity of the agricultural community (as well as the other communities they work with) provides an example of a really holistic approach to housing. Insulation-enhancing framing details of doors and windows. Natural and environmentally friendly flooring and finishes. Construction waste management, with 71 per cent diversion to recycling. The water saving features and resident education about water use have together resulted in 40% less water being used in this community than in similar apartment communities. Fruit trees and community garden plots, while not the most water efficient choices, were included for the enjoyment of the residents. The annual operating costs of Mutual Housing at Spring Lake are expected to rise on average by 3 per cent per year. Some expenses (such as water, sewerage, insurance, staff salaries and repairs) are expected to rise at a greater rate while other expenses (such as administrative costs and electricity) are likely to rise at a slower rate. Rental income is also expected to rise each year as well as the US Department of Agriculture rental subsidies. As the property ages, the reserves will be used to fund larger, capital improvement projects. Mutual Housing California obtained capital subsidies for the construction of this development from federal, state and local government sources. It also obtained rental subsidy from the US Department of Agriculture (USDA), which helps ensure the revenue will be sufficient to cover ongoing operating expenses. While no additional external subsidy is needed, the fact that the USDA rental subsidy is subject to annual renewal does create a potential risk of reduction due to federal budget cuts put forward by the new presidential administration. It is likely, however, that subsidies committed to existing projects will be at less risk than the rental assistance made available to future housing developments. With the USDA rental subsidy in place, no family living in Mutual Housing at Spring Lake will pay more than 30 per cent of their monthly income on housing costs, helping them to realise substantial savings compared to rent and utility costs in conventional market rate housing and leaving more money for other expenses. 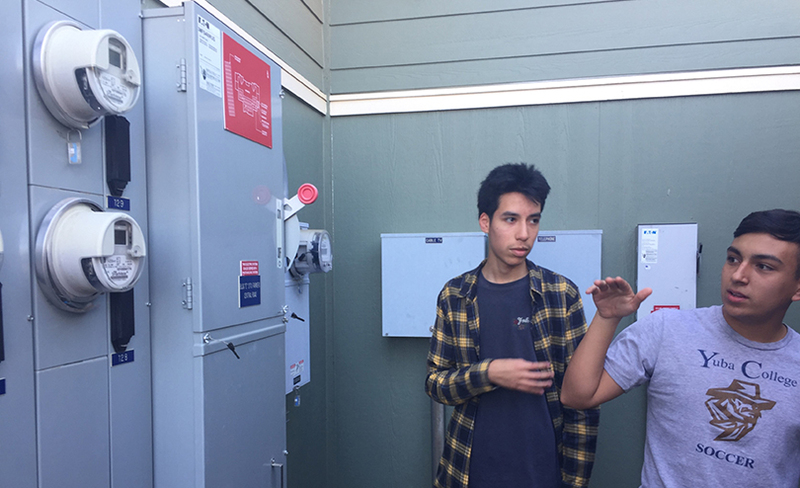 The Zero Net Energy design allows each family to save on utility costs with the potential for having some months when they pay no utility bill at all. 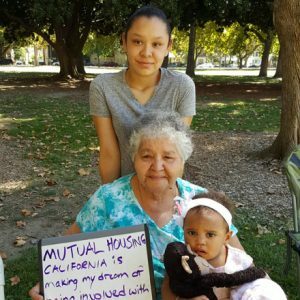 Mutual Housing California’s financial training helps build resilient communities through participant-driven financial learning and action programmes. Financial capability classes and activities such as peer lending circles provide residents with the support they need to help them make positive decisions about their money. This helps them achieve financial stability, work towards increasing their assets over time and helps them reach long-term financial goals such as saving for university, home ownership or micro-business start-ups. What is the social impact? Mutual Housing at Spring Lake residents benefit from partnerships with local community organisations and businesses that contribute services and volunteers on-site. These include food assistance through a drought relief programme of the Yolo County Food Bank, financial training provided by a local credit union, computer literacy training with interns from a local university and donations of holiday gifts and back-to-school backpacks and supplies from both individuals and local businesses. This project was first developed for the purpose of providing high quality, healthy and affordable housing with low utility costs for agricultural workers and their families. It now supports those families in building a strong community through resident participation and leadership development. Residents are encouraged to organise activities and participate in the community. This has helped to develop people’s leadership skills and strengthen solidarity amongst residents. Formal leadership training, one-to-one mentoring and ‘on-the-job’ experience are all available. A ‘Culture of College and College Ambassadors’ initiative has recently started in the community. Young people from low-income agricultural backgrounds may not have considered that college or university was within their reach. The aim of this programme is to encourage young people to think that education is important and that attending college or university is possible for them. The Green Leaders programme recruits and trains residents to plan, lead and carry out green education projects in the community. The aim is to spread awareness of green living and demonstrate its environmental benefits to everyone. Long term impacts for the wider community include the energy and enthusiasm of the new community leaders – a new group of vocal advocates for climate change solutions. As more people experience first-hand the benefits of green building and green living, the voice for equitable and sustainable housing for all will be amplified. The Mutual Housing development team had a steep learning curve when they set out to achieve Zero Net Energy for multifamily rental housing. This required broad capacity building as the entire team gained a greater understanding of the science, methods and measures involved. While working with new technologies was essential in realising the sustainability goals, there were some difficulties obtaining effective technologies not available locally. There were also some challenges in evaluating the risks associated with new systems which didn’t have a proven track record. The most significant challenge faced was the uncertainty of securing sufficient financing in an era of drastically reduced funding in local, state and federal government programmes. In the end it took Mutual Housing California three years to gather all the funding needed to take forward the development. The continued scarcity of public funding is the biggest challenge standing in the way of developing more innovative projects like Mutual Housing at Spring Lake. Although Mutual Housing at Spring Lake is an exemplary project which provides quality housing for agricultural workers, the extent of need in the area is still considerable, with limited movement towards recognising and advocating for the rights of this group. The capacity of the community itself to fight for the right to safe, secure and affordable housing is growing but remains limited and substantial progress is still needed to recognise and protect the well-being and health of this community. Mutual Housing California is now working to develop the nation’s first certified Positive Net Energy rental housing development as the second phase of agricultural worker housing at Mutual Housing at Spring Lake. This initiative, for the creation of 39 new high quality and affordable homes, will be fully consistent with and expand on the lessons learned from the successful first phase. This new Positive Net Energy community will incorporate highly energy efficient building systems while also producing alternative energy through the use of solar panels. Ultimately, the solar panels will produce more energy than the buildings are expected to use and excess energy can either be stored or sent to the local grid. One key lesson learned is that the Green Divide will only be closed if low income and minority people themselves are actively involved and empowered to make decisions. It was local agricultural workers participating in the original surveys who inspired Mutual Housing to aim for Zero Net Energy as a means of reducing utility costs. Another lesson learned during design and construction is the importance of having a ‘Zero Net Energy Champion’ who coordinates team goals and continually encourages high levels of collaborative communication and problem-solving. Designing and building Zero Net Energy certified buildings is not enough. Resident education and the success of the Green Leaders team have ensured residents are not only inspired but understand how to reduce energy usage and expense. For future developments, Mutual Housing California will know more about managing the expectations of energy savings. This is achieved by considering the difference between the projected average usage of “energy conscious” households and the actual consumption of the residents themselves. Housing 62 agricultural worker households in affordable, permanent, safe, sustainable housing close to employment and services. Coming close to achieving Zero Net Energy in the first full year of operations. While the solar panel system generated the expected amount of renewable energy, the community consumed approximately 25 per cent more electricity than expected. 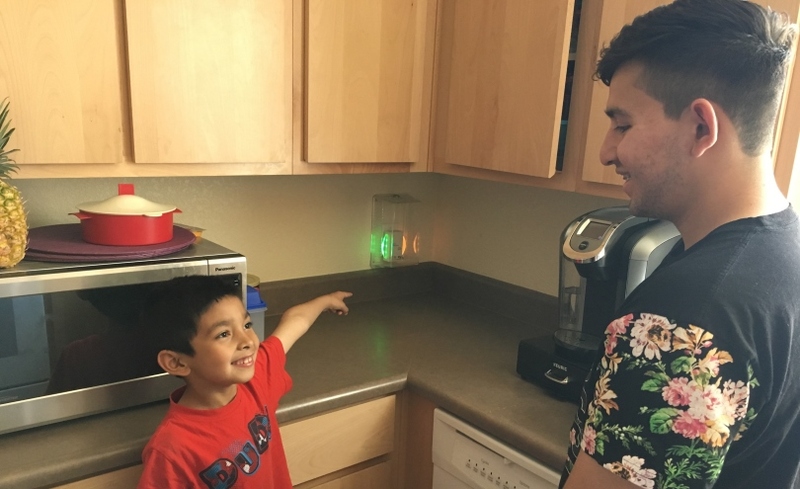 Mutual Housing has developed a strategy moving forward to work more closely with the resident households using the highest amounts of energy and to continue education and support of all residents in meeting Zero Net Energy goals. A formal evaluation of the benefits to residents has not yet taken place. However, the fact that families pay on average just US$20-30 per month in utility bills is a big factor in ensuring affordability. Residents are enthusiastic about the high engagement, inclusiveness and shared decision-making which takes place. This is not something they had previously experienced. Since completion there have been more than 20 tours of the Mutual Housing at Spring Lake site. This has included the US Department of Labor, US Department of Agriculture, American Planning Association, Environmental Justice Coalition for Water, California Energy Commission, and Sweden’s Deputy Prime Minister. There has also been extensive media attention. US Department of Energy – Housing Innovation Award. US Green Building Council Green Building Awards – Category: Equity. 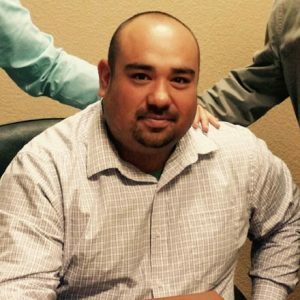 Sacramento Housing Alliance – Housing Innovation Award – Category: Multifamily. Green California Summit – Green Leadership Award – Category: Green Building. 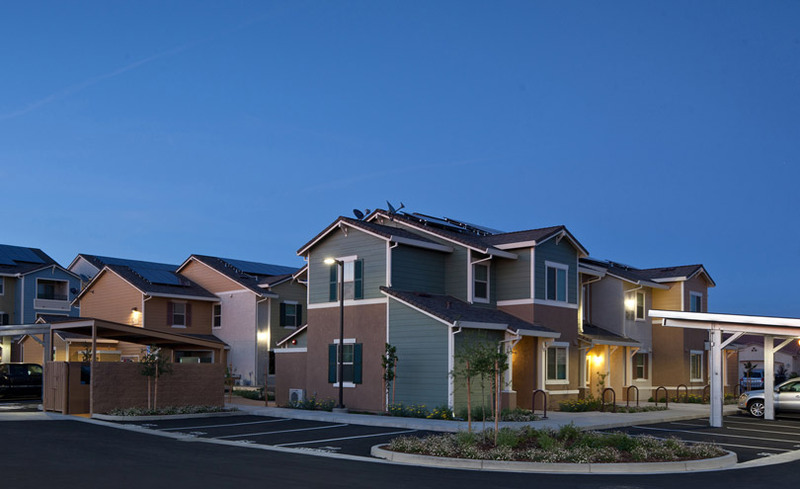 Since completing construction in 2015, Mutual Housing California has been very active in showcasing this Zero Net Energy development as a model for future developments in California and throughout the USA. Mutual Housing is currently designing a second phase of homes at Spring Lake which will be the nation’s first certified Positive Net Energy rental housing development. This will create a further 39 affordable homes for agricultural workers, expanding on their success of achieving the first Zero Net Energy Ready rental development certified by the US Department of Energy in the country. The State of California, in establishing high goals for energy efficiency and renewable energy production, has given a boost to the potential role for Mutual Housing as an example of good practice. 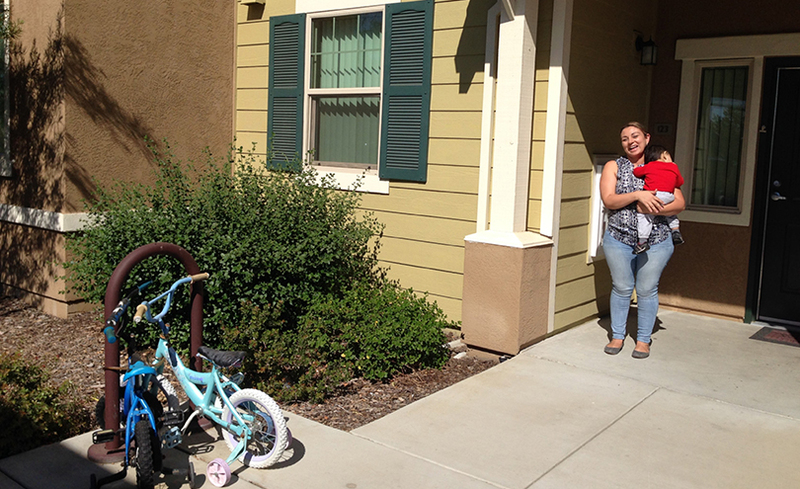 The assumption in the housing industry that renters are transitory and don’t take pride in their homes is challenged by the experience of Mutual Housing at Spring Lake. By focusing on community building, leadership development and green education, the residents develop a strong sense of pride in their homes. Low-income people want to be a part of the solution to global warming. Staff and residents host regular informational tours of the community and staff from Mutual Housing California also participate in planning discussions held by national and state agency groups and coalitions that share the same vision. 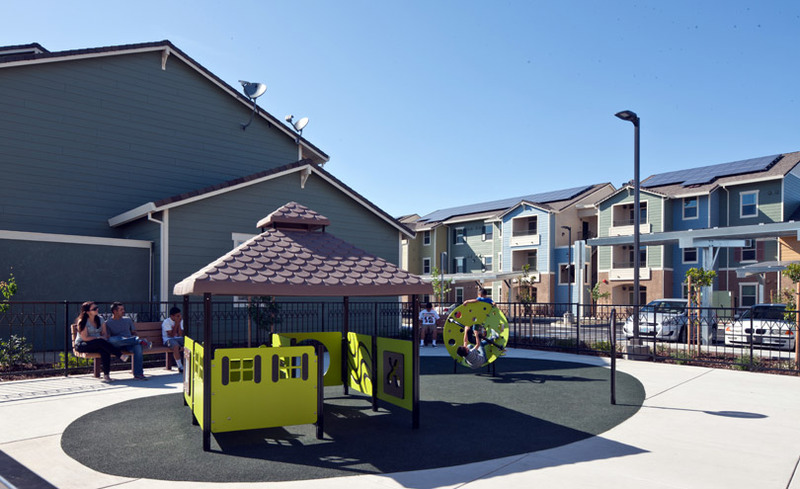 Lastly, with the help from the US Department of Energy and other housing advocacy groups, Mutual Housing has distributed case studies among other housing developers throughout the nation detailing the project’s innovative features. They will soon be publishing a paper with information on the various processes used to reach Zero Net Energy and will be distributing it nationally to multifamily and affordable housing developers. 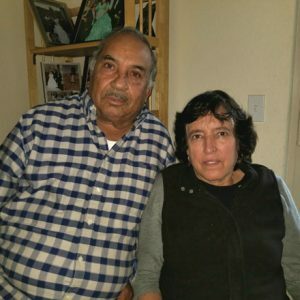 Saul Meneses is 75 years old and moved into Mutual Housing at Spring Lake with his wife Orfalinda in July 2015. It has been a complete one-hundred eighty degree turn since we’ve been living here. Housing stability has enabled me to reflect on my past and though we have had stressful experiences, we still believe we are living a blessed life. My sight was deteriorating in the early 2000s and I am only able to see a person’s silhouette. Recently my sight and health have started declining further but I still feel blessed. I do not want to complain and want to continue living life. I want others not to see me down or depressed. I want to inspire by continuing to live my life and move forward. I believe that God has given me talents and blessings in my life which inspires me to give back to the community, even if it is something humbly small. Our quality of life is better now. It is peaceful living in the Mutual Housing at Spring Lake community. Before we used to live in a community where neighbours played loud music at all hours with little regard for others. Air space was not respected either as people smoked wherever they pleased. For five years, we lived in an apartment there that was very cold and in poor condition. My wife had to board the windows up with tape and unclog the sink daily. Over the course of those five years we had made several attempts to move but all failed. We have a modest income from my pension that helps us meet basic needs of food, water and shelter, but the harsh living conditions were hard to endure. Now less of our income goes to rent and I know the challenge of enduring our previous rental home would have only become tougher. Since living here we have made connections with Community Organisers and they graciously nominated me for an electric wheel chair through an Umpqua Bank program. Even though I lost my feet, the wheelchair has helped me get around and become more physically independent. I have taken part in a financial education and lending circle program. It is called a tanda in the Hispanic community. The way it works is that each person in the circle promises to put a set amount of money into the pot every month for as many months as there are people. It has helped me tackle emergency bills and even increased my credit score. I feel like it has helped me be more financially stable and it was made possible by relying on my neighbours for support. The experience made our community even stronger. At a green leaders presentation my wife and I learned how to reuse glass bottles to make beautiful vases and kitchen accessories. We are proud to be a part of a community that cares for the environment. We love our neighbours and enjoy the harmony we’ve developed. It is an empowering feeling to have our community play such a big part in stabilising our lives. We hope to be living at Mutual Housing at Spring Lake long into the future. Helen Corona got married and moved to California in 1964 at the age of 15. She worked in the fields with her husband and their eldest three children. Her husband passed away 25 years ago. Nearly my entire life I have been a field worker. As a child I remember going from Arizona to California yearly to work in the fields. This type of work is very laborious and pays by the pound, not by the hour. After my husband’s passing my children and I moved to Woodland. The cost of renting the house that we lived in was equivalent to 90 per cent of the income I was earning. In addition to being very expensive, the place was also infested with roaches. One day, while collecting food from a food bank, an employee mentioned Mutual Housing at Spring Lake to me and urged me to apply. The process went by fairly quickly and the management team was very helpful. I still remember when I received the phone call with the news that I had gotten the apartment, I couldn’t believe it; I felt like it was a miracle. I love it here at Spring Lake, the Manager and the Community Organiser are very friendly and have always been helpful. Living here I have been given opportunities to grow as a leader. I shared my story at a community tour for the public. I volunteer in our community room to help disperse local food bank donations for those in need of some additional bread and produce from time to time. I now attend resident council meetings, help to plan our social events and have gained pride knowing I am part of a larger movement to build a stronger community. With my new ability to save some money I was able to invest in a car for reliable transportation. I also purchased new furniture and got rid of the old infested ones with the help of my children. I now have a very active and fulfilled life in the most stable home I’ve ever known. 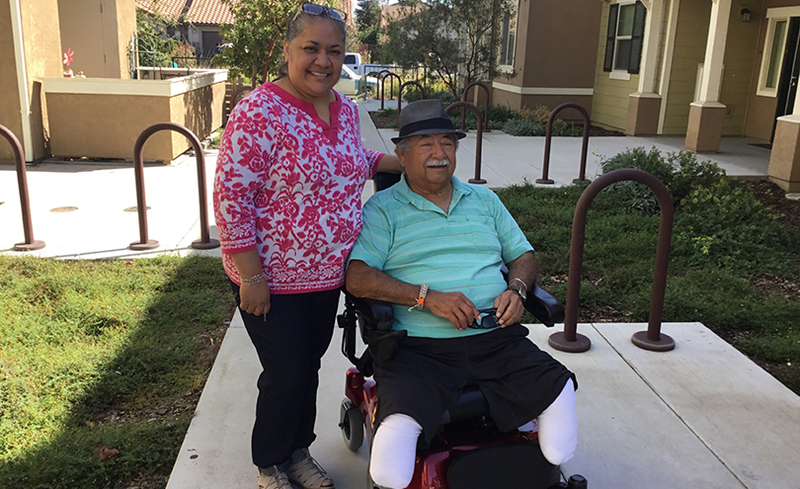 Hector Sanchez has lived at Mutual Housing at Spring Lake since April 2015. I used to live in a studio apartment that was in disrepair and paid an unreasonable amount of my income on rent. It was in a neighbourhood with a lot of vandalism and the property management staff were unable to solve maintenance and other problems that came up at the apartments. My apartment now is spacious and it is part of a community with a mix of housing options for single-person households and family households. Here my neighbours and property management staff take pride in working together to maintain a beautiful and peaceful community. Prior to living here I worked cleaning grain silos but I had an accident which left me trapped in a silo and I almost lost my life. From that unfortunate accident I was left with chronic physical and mental health conditions. Now that I am physically unable to work and on a fixed income, it means even more to me to have a quality affordable place to live while being surrounded by families and people of good intentions. We strive to build a community with one another knowing that each of us shares a connection to the agricultural land. Through the Community Organiser and other staff I have been presented with opportunities to work though some of my past traumas and grow my leadership skills. Every so often there are tours given to the public of our community. I was given the unique opportunity to share my story for one of the groups of visitors. Though it is hard recounting some of the traumatic parts, I really gained a sense of pride for being where I am today and received such overwhelming support from everyone in the room that day. From that experience I gained confidence to go share my story with our state elected officials. The goal was to explain the impact of my Mutual Housing at Spring Lake home. It was part of a state-wide lobby day coordinated by affordable housing advocacy organisation Housing California and their Residents United Network. It struck me during those earlier experiences of being a resident member of Mutual Housing at Spring Lake that my home was much more than just a place I could afford. It was a supportive community from all angles – staff, neighbours, volunteers, and even the ones who designed the energy saving features. Recently I even enrolled in the Digital Literacy Program. A Mutual Housing instructor is guiding us through a series of 10 courses that is self-paced. So far I am learning how to use the keyboard and mouse better. By the end I will also know how to browse the internet effectively and use spreadsheet and word processing tools. After completing the program all graduates get a free laptop computer to own. Having these new skills and a home computer will help me accomplish my larger goal of being more proficient in English, as it is my second language. While I am excited at all the possibilities to grow within the Mutual Housing at Spring Lake community, I look forward to seeing my neighbours lives transformed as well. Guadalupe Jimenez moved to the United States in 1979 and worked in agriculture picking peaches and apricots. When I moved here, landowners provided homes for farmworkers and my boss let me live on the land. I stayed there for eleven years, but my boss suddenly decided to close their business. Needing a new home, my wife and I were taken in by my son’s family. The four of us lived together in a one-bedroom apartment. We lived there for fifteen years while working in the tomato fields, picking and cleaning the tomatoes. Seeking more space we all moved to a two-bedroom apartment paying $600 per month. We left the bedrooms for my son and grandchildren. My wife and I would sleep in the living room on the couch. We felt it was not a bad apartment but it was not in the greatest condition. Whenever we brought up concerns or the idea of renovating the apartment the manager would respond with a rent raise; threatening to charge us instantly 66% more in rent. By that time, my son and daughter-in-law had four children. After living with them for seventeen years, we decided to seek our own home. My daughter-in-law helped us research affordable homes in the area and learned about Mutual Housing at Spring Lake. Now, my wife and I are living comfortably in our own apartment. My son stayed in their existing home with his wife and four kids. Gone are the stresses that go with living in cramped living spaces and unspoken burden placed on my son’s family. We have our own living space, with our very own ADA (Americans with Disabilities Act) accessible community garden plot and our grandchildren have gained space to play freely. Our home is more than just an affordable place to live. It has Community Organisers and property management staff who are passionate about their work and the mission of Mutual Housing. I see it when they invite me to meetings and community events. A group of resident volunteers called green leaders once shared a presentation with our community about ways to care for the environment. I learned about recycling and how to save energy. By using some of their tips we have lowered our energy bills. The connections I have made with staff and neighbours here even gave me the courage to share my life story at one of the Mutual Housing public tours. I feel transformed by this community.